I jumped into the passenger seat and he placed two bags of what looked like rifle cartridges connected to baling twine on my lap. “Don’t shake the bag,” he said as we sped down the driveway, turning into a field where my dad had earlier unearthed a rock the size of a small cow with his 2-bottom plow. Ben had me stay in the car as he dug small holes around the rock, and then called for me to “bring a couple of those things in the bag, and be careful”. He connected them together and lit them with his half-smoked cigar. We hurried back to the car, quickly backed up 200 ft. and waited. In less than a minute, that rock exploded into a hundred different pieces that flew 150 to 200 ft. into the air. “Holy cow,” is all I could say, in wide-eyed amazement. It was my first exposure to dynamite and blasting caps. Thereafter cousin Ben was known as Dynamite Ben, or DB, till the day he passed. In the ensuing 10 years DB and I blasted stumps, trees, rocks, foundations, ditches and beaver dams. His mode of transportation was always the old Chevy, the trunk and back seat loaded with 6 boxes of dynamite, and me holding the blasting caps. “Don’t get those caps and that dynamite close to each other,” he said often and loud. “They act like mad cousins”. I had no reason to doubt him. The final phrase on one page, like an afterthought, said that large holes would need to be filled before crops could be planted. How well I knew that, having spent several hours with our Farmall M and trip bucket loader filling DB’s huge cavities on 40 acres of our farm. Other pages of the brochure cited the cost of blasting stumps from one acre at just 39 cents apiece, $18 for a full day’s work. A few years ago, I recall hiring an excavator to clear two acres of box elders and scrub oak and the tab was $1,700. No dynamite, only a huge Caterpillar. 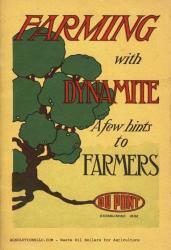 Breaking up hard-pan, shale and clay soils was also an easy job for dynamite. The brochure told of a Kansas farmer who dug 2-in. holes 3 ft. deep about 40 ft. apart equidistant on a 100 acre field. In each hole he placed half a stick of dynamite and set them off in sequence. “The explosion loosened the soil and made a reservoir for rains,” the brochure stated, and “now the farmer has the finest 100 acres of hay ground in the state.” It never mentioned possible damages to windows or glassware in Mom’s cupboards. The brochure also mentioned “ditching and plowing with dynamite,” something that DB and I did on a 20-acre field with a pothole in the center. My dad had tried draining that pothole three years in a row by plowing dead furrows through the ridge, but they always filled back in. One fall DB and I laced that shallow trench with a full case of dynamite and set it off. “Just like the trenches I used to blow in the war,” DB said with a smile. Unfortunately, the following spring the 6-ft. trench worked so well that the creek reversed flow and filled the pothole deeper than ever. DB has been gone for nearly 50 years, but memories of days spent with him “farming with dynamite” are as distinct to me as the smell of freshly tilled soil.